Spaghetti Bolognese, the best comfort food no matter the season. A fabulous homemade bolognese sauce full of big flavours, and the nation’s favourite pasta make the best combo for a healthy and nutritious dinner. If there is one dish I would gladly eat at any time of the day or night, this has to be spaghetti bolognese. 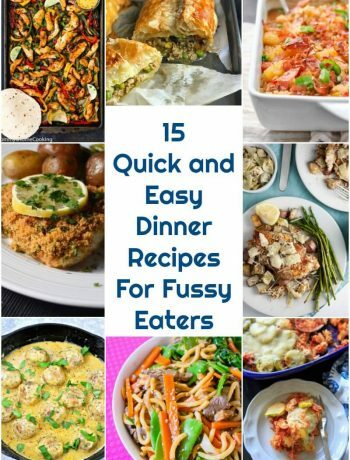 It just screams comfort food to me, and that’s what it does best – soothes and comforts you like no other food. For me, this is the mother of all dishes. The Italian spaghetti alla bolognese, or spag bol has to be one of the best recipes one can ever make at home. If you go for the ready-made version that the stores have to offer, then be prepared to be disappointed. Most fresh or frozen spaghetti bolognese will have no real taste. 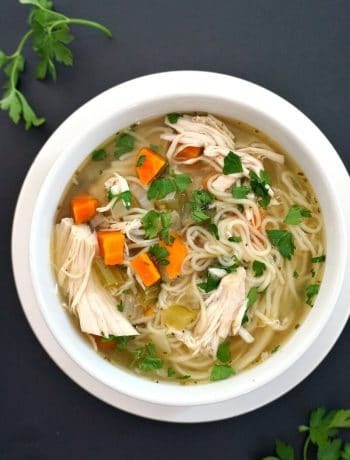 So, why not make it at home with a few simple ingredients? It’s really cheap too, and with less than £6 you get to feed the whole family. 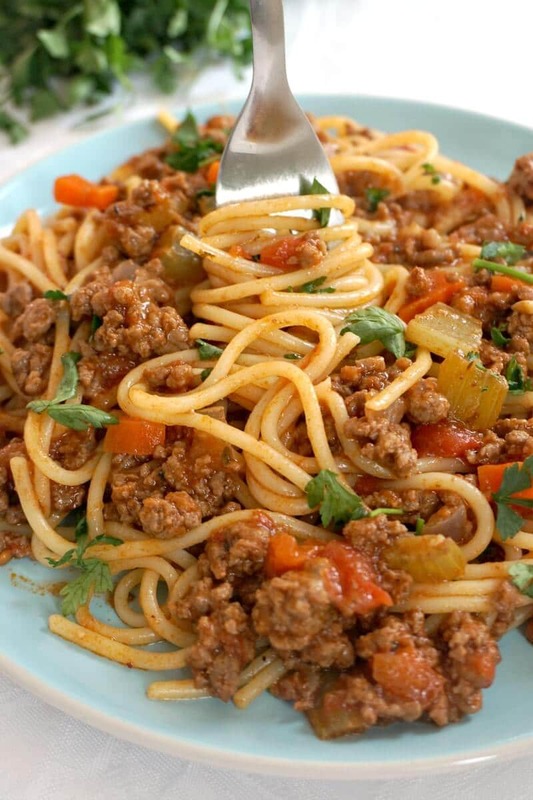 If you are not a fan of beef, how about the ligher, but as delicious Turkey Bolognese? 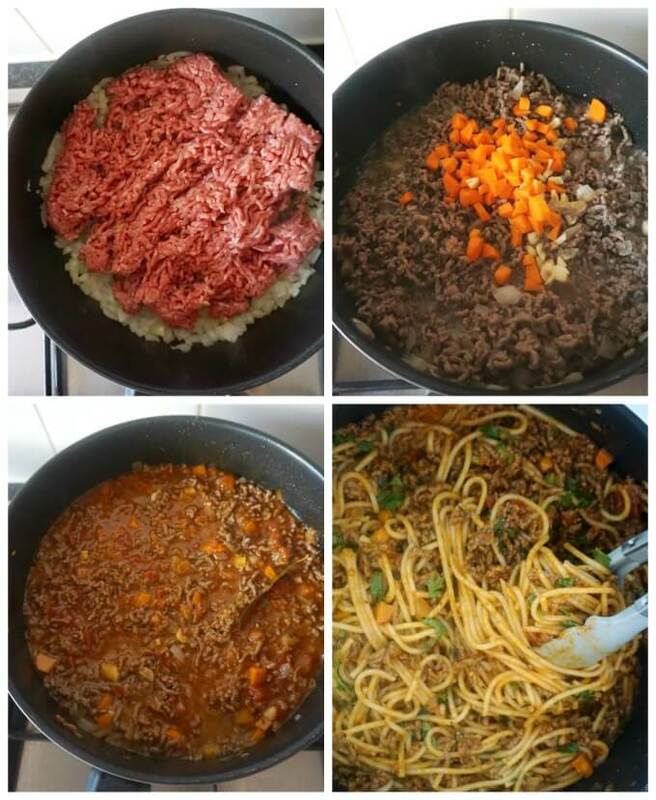 How do you make easy spaghetti bolognese? 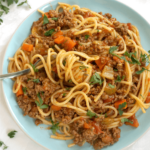 The traditional spaghetti bolognese uses beef, although variations are also common, like beef and pork, turkey, chicken, lamb and so on. Now, some people might no cook the beef bolognese for so long, but I like the meat super tender, so I like adding beef stock first, let it cook until it’s all absorbed, then add the chopped tomatoes. Add the cook spaghetti together with the parmesan and parsley, and give it a good stir, then remove from the heat. And that’s the bolognese done! Can you freeze the bolognese sauce? Absolutely! I actually always cook a double batch, just so I can freeze some. 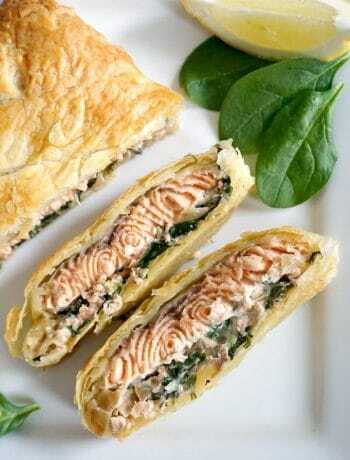 It helps if you freeze it in smaller plastic containers, so that you can only defrost the amount needed for one meal. Note! I usually put the bolognese sauce that goes in the freezer aside, and add the spaghetti to the remaining sauce. I prefer cooking fresh pasta every whenever we need, rather than freeze it with the sauce. I find that the texture of the pasta is not as nice once defrosted. 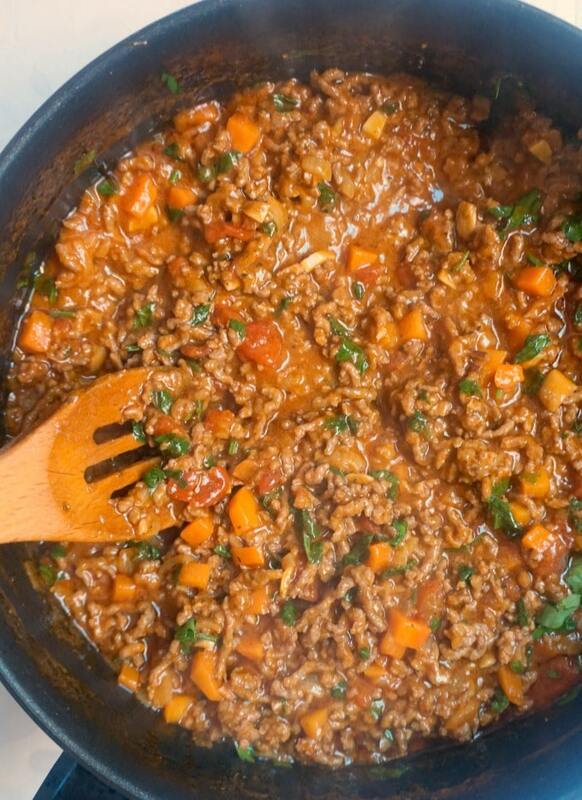 Can you cook bolognese sauce without red wine? Some people like adding red wine to the sauce, I personally don’t cook with wine, purely because we are one of those weird people who don’t really drink alcohol, for no religious or any other reason. So, since there is no alcohol in the house, I can’t possibly be bothered to buy some wine for cooking only. Plus, there will be lots left, and throwing it makes no sense at all. Now, I absolutely love the wine-free version of the bolognese sauce, but if you want to add wine to the sauce, add it after the onion has softned, and let it cook until it evaporated, before adding the remaining ingredients. 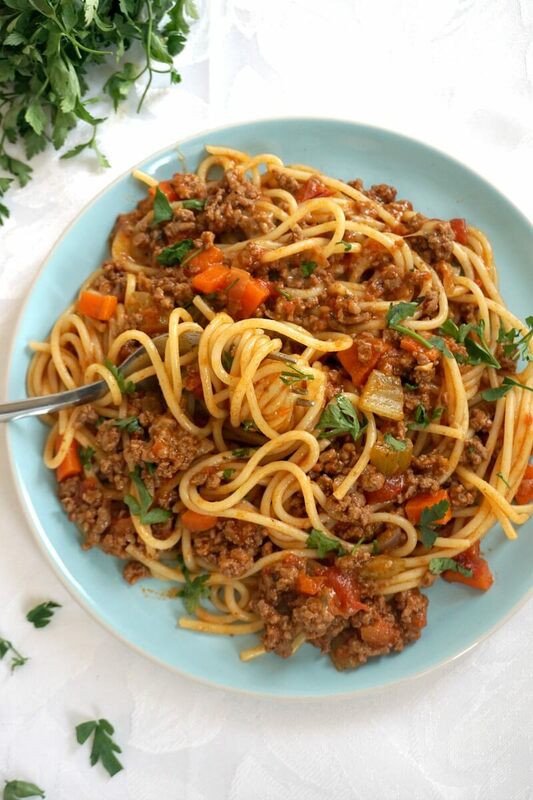 If you’ve liked my EASY SPAGHETTI BOLOGNESE or any other recipe on the blog then don’t forget to rate the recipe and let me know how you got on in the comments below, I love hearing from you! You can also FOLLOW ME on FACEBOOK, INSTAGRAM and PINTEREST to see more delicious food and what I’m getting up to. Spaghetti Bolognese, the best comfort food no matter the season. A fabulous homemade bolognese sauce full of big flavours, and the nation's favourite pasta make the best combo for a healthy and nutritious dinner. Heat up the oil in a large pan, the chop the onion and add it to it, leaving to cook for about 3-4 minutes until transluscent. Add the ground beef, and stir continuosly, until the beef is browned all over. Chop the carrot, garlic and celery sticks, and add them to the pan together with the beef stock. Leave to cook with the lid on until the liquid is reduced, then add the chopped tomatoes and leave to cook until the sauce is reduced again. Season with salt, pepper, add the parmesan, Italian herbs, and parsley, and turn off the heat for now. Separately, cook the spaghetti according to the packet instructions, then drain the water, and add the spagetti to the pan. Turn the heat on again, and mix everything well, stiring for about 1-2 minutes so that the sauce can coat the spaghetti well. When ready, remove from the heat and serve hot.